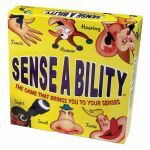 Get ready to touch, see, smell, balance, listen, laugh and more through this unique game of the senses. Can you identify a hidden letter by touching it? Can you guess how many balls are in a box by listening to them? Teams race to complete all kinds of fun, easy-to-play challenges in over 10 different categories.